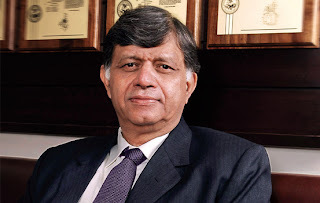 Vinod Ramnani, Chairman, Opto Circuits India Ltd.
Opto Circuits India Ltd (BSE: 532391, NSE: OPTOCIRCUI) counter in NSE, on Thursday, witnessed a significant buy of 12.63 lakh shares by the FII, HSBC Global Investment Funds. The deal was disclosed at National Stock Exchange after trading hours on Thursday. The day was tumultuous for the medical equipment maker, as its stock fell by around 15% in both BSE & NSE, and recorded a new 52-Week Low of Rs. 117.15 in both the exchanges. Though there was only one identifiable institutional seller, offloading 15.88 lakh shares of Opto Circuits, the overall selling pressure was evident with daily volume surging to 5 times of 5-Day Average Volume at both BSE & NSE. The seller was the foreign institutional investor, JF India Fund, which offloaded a 0.66% stake on Thursday, at the rate of Rs. 123.80 a share. Volumes as well as negative price movement has been accelerating in the Opto Circuits counter since the last 30 days, due to a suspicion about its credit standing as expressed by ICRA, an Indian credit rating agency. Thursday’s only identifiable buyer, HSBC Global Investment Funds, already held a 3.42% stake in this Bangalore headquartered niche medical equipments and consumables player with several overseas subsidiaries and marketing reach in over 150 countries. On Thursday, the HSBC unit’s buy amounted to an additional 0.52% stake, and appears to be not only a reasonable accumulation, but designed to signal the market of institutional support. Only buys or sells above 0.50% need be identifiably disclosed. Nevertheless, the HSBC move which cost the FII Rs. 15.26 crore on Thursday, at a per share rate of Rs. 120.86, is likely to help the Opto Circuits counter. The company and the stock need to garner all the support it can rally around, as the once high-flying midcap stock has been on a serious downtrend during the last six months, which accelerated after the ICRA downgrade on one of their debt instruments. Opto Circuits India Ltd, has reasonably countered most allegations so far, by giving explanations for some core issues the rating agency had raised, and even publishing letters from three of its lenders - Standard Chartered Bank, DBS Bank, & IndusInd Bank - that the credit facilities they enjoy are still standard assets or in a healthy position. However, the company has also got into an undesirable spat with ICRA over the issue, claiming that the rating agency has already been removed from its role in early July, and that its competitor CRISIL has been appointed in its place. This has given rise to speculations whether there is any serious corporate governance issues, lurking beneath the surface. Several midcap companies in India have recently come under intense scrutiny for poor governance and accounting practices. In media interviews on Thursday, Opto Circuits’ CMD, Vinod Ramnani, also claimed that ICRA has been removed not post their report but prior to that. At the crux of the dispute is whether Opto Circuits has run into a serious debt situation as well as a serious negative cash flow position. The company’s latest stand on these issues is that the debt pile up is due to its growth strategy that has mainly relied on expensive overseas acquisitions, while the cash flow situation is likely to improve due to working capital cycle falling by 20 days on a quarter-on-quarter basis. The key subsidiaries of Opto Circuits are 5 USA based group companies viz. Cardiac Science Corporation, Criticare Systems, Maxcor Lifescience, Mediaid, and Unetixs Vascular; one Germany based company, Eurocor; 7 India based subsidiaries viz. Advanced Micronic Devices, Devon Innovations, NS Remedies, Opto Cardiac Care, Opto Eurocor Healthcare, Opto Infrastructure, and Ormed Medical Technology; and one Malaysia based subsidiary, Opto Circuits (Malaysia). Even though it is in a challenging financial situation now, it can’t be denied that Opto Circuits has so far exhibited good growth characteristics. During the last four years, it has improved its consolidated sales by more than 5 times, while its net profit has jumped by 4X times during the same period. Its most recent Q1 numbers also show reasonable year-on-year growth in the topline and bottomline. Opto Circuits produces and markets medical equipment & consumables like Patient Monitors, Pulse Oximeters, Vital Signs Monitors, Respiratory & Anesthetic Care Monitors, Diagnostic and Therapeutic Cardiology Devices & Systems, Automated External Defibrillators, ECG Systems, Stress Test Systems, Holter Monitoring Systems, Vascular Diagnostic Equipment, Sensors, Accessories, Components etc. It is also active in the higher margin segment of Interventional Devices like Cardiac Bare Metal Stents, Drug Eluting Stents, Coated Balloons, Peripheral Coated Balloons, Replacement Implants, and Catheters. For investors, Opto Circuits has maintained excellent return ratios with FY’11 Return on Investments (RoE) being an impressive 26.87%. The current concerns with the stock is more to do with the question whether that kind of growth and returns are possible anymore, given its high debt of around Rs. 1000 crore, and cash flow situation that may take more than a year to stabilize after a serious capital expenditure. At the same time, Chairman Ramnani tried to project a continuation of this high-stress strategy on Thursday, when he disclosed that this year’s capex would be Rs. 250 crore. The future trajectory of the stock will depend upon the calls major institutional investors in the counter will take in the coming sessions. The stock has a high institutional participation of 37.29% dominated by FIIs, even after their participation coming down steadily during the last few quarters. Major investors in the counter, apart from HSBC, are Genesis Indian Investment Company, Royal Bank of Scotland Plc as Trustee of the Jupiter India Fund, Ashoka Flowering Tree Mauritius, Allianz RCM BRIC Stars Fund, Carnegie Founder AB A/c Carnegie Emerging Markets, and Jupiter South Asia Investment Company. The company is also hoping that an upcoming rating by CRISIL would clarify the situation in a more positive light. On Thursday, Opto Circuits closed trade in NSE at Rs. 121.15 down by 12.15%.